It is popular online to describe things in terms of other things. Something may be the Ryan Gosling of pita chips or the Khloe Kardashian of bed bug eradication services or the Connecticut of Rhode Island. I decided to have some fun with events coming up in February by labeling them as comparisons to other events. Feel free to update your calendar accordingly. 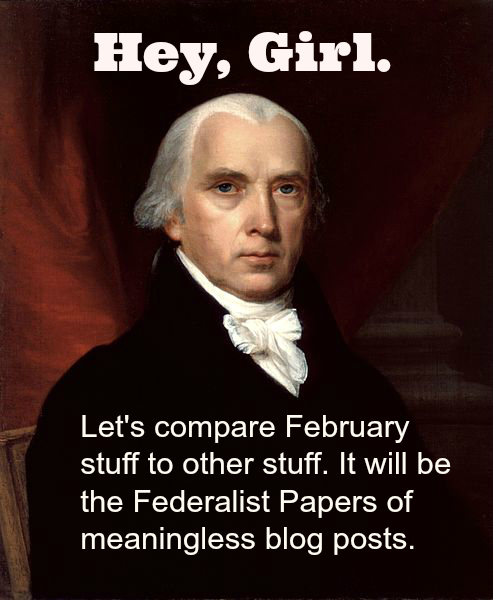 By the way, if you couldn't figure out the title, James Madison was the shortest U.S. president just as February is the shortest lunar month. Can you do better? Suggest other comparisons to describe February and February events in the comments below.